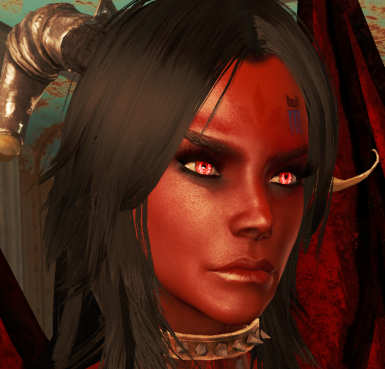 Face preset (for use with Looksmenu) that I use for my succubus character Kim "the Enchanter." Looksmenu preset for my succubus Kim. Use NMM, or place the unzipped json file into your "Fallout 4\Data\F4SE\Plugins\F4EE\Presets" folder. Q: Where can I get the demon wings like in some of the screenshots? A: I ported them from a mod for a different game myself and retextured/edited the 3D model. I won't be releasing them here until I make my own 3D model, since the 3D model is not my own work and request for permission went read but unanswered. So unfortunately they are not currently available on the nexus. Q: What about the horns?